Harlin McEwen (right) speaks at the Hyatt Regency Inner Harbor in Baltimore as Stan Reubenstein, WA6RNU, looks on. About 125 members and guests attended an RCA breakfast meeting at the Hyatt Regency Inner Harbor in Baltimore on Aug. 8, 2007. The meeting was scheduled during the four-day national conference of the Association of Public-Safety Communications Officials. 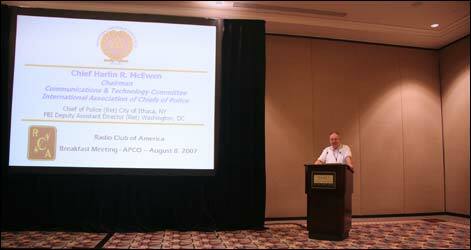 Harlin R. McEwen, a Fellow of the Radio Club, delivered a speech about the efforts made by the public safety community to shape the use of 24 MHz of spectrum allocated for public safety use in the 700 MHz band. He explained how the community responded to somewhat unexpected requirements the FCC proposed for that spectrum. The speed at which the regulatory situation is changing makes Harlin’s remarks highly timely, so I hurried to prepare a transcript from my notes. If the transcript has errors, the responsibility is mine, not the Club’s, and not the speaker’s. Harlin’s background is so extensive that to offer it by way of introduction would be lengthy. If you would like details, please have a look at his biography on an SDR Forum web page. Briefly, Harlin is president of Public Safety Spectrum Trust, a not-for-profit corporation. He also is chairman of the Communications & Technology Committee of the International Association of Chiefs of Police. He advises several other law enforcement associations. He is a retired police chief and a former deputy assistant director of the FBI. 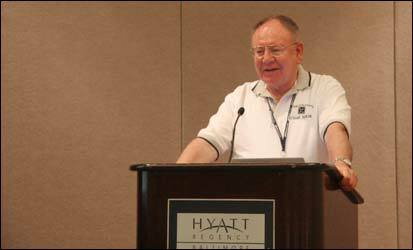 Harlin R. McEwen speaking at the August 8, 2007, RCA breakfast meeting. I want to review where we are and where were going. Ill talk about the basics and then go to the 700 MHz proceeding. Most of you understand the limitations: whether we ought to have more radio spectrum and why do we need it and why cant we be more efficient and be better managers? We do a pretty good job of it and work hard, and its not an easy task. When you look at these slivers of spectrum starting with the yellow lowband sliver and go to VHF highband 3.6 MHz, UHF 3.7 MHz and in the 800 band 3.5 MHz and 6 MHz in different areas, which are being re-juggled now, as you know. We were actually awarded 24 MHz in the 700 band, and we also got a whopping amount, 50 MHz, in the 4.9 GHz band, which is good for hot spots and local area uses, but not mobile networks. Within 50 MHz for mobile purposes, we have 47 MHz of spectrum on this chart. As I testified in the Senate and House in two hearings while battling the commercial industry, they have 528 MHz of spectrum for commercial services. We dont dispute that they ought to have that and have more. We dont argue that the public isnt demanding of more spectrum and services. For those of us who toil in the public safety arena, we have to be advocates for more spectrum resources to do our job effectively. In 1995, the FCC with NTIA established the Public Safety Wireless Advisory Committee. Many people in this room were involved. They spent a lot of long days and travel. 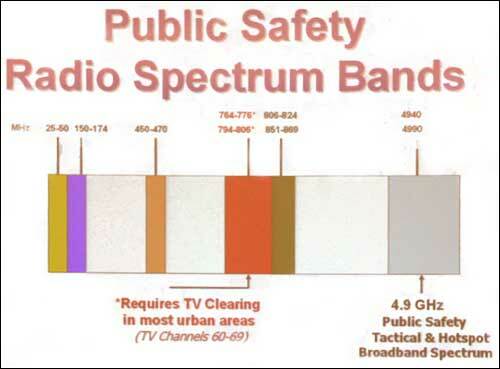 On Sept. 11, 1996, a notable date because it was five years before the tragic events of 2001 — five years before that, PSWAC released a report for current and future spectrum needs for public safety. Many people in this room were involved. It was recommended that public safety needed 97.5 MHz of additional spectrum including 25 MHz within 5 years. As a result — and I wont go into details, but some know them as well as I do — how Congress made the FCC do the right thing, to be blunt — in the Balanced Budget Act of 1997, they required the FCC to allocate that 24 MHz in the 700 band that we are now involved with in many discussions before us in the past months and year or so. On Aug. 6, 1998, the FCC created the public safety National Coordination Committee. The NCC involved many in this room for hours and days of study. The purpose was to recommend to the FCC how the rules should be created for the 24 MHz of spectrum. Remember, we have little slivers of spectrum. This is a big chunk of spectrum — the first time we have something in one area. 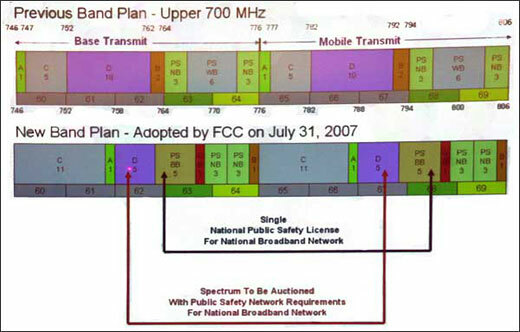 In a report released on July 2003, the NCC recommended that half, 12 MHz, be designated for urgent public safety voice. The reason is because in many major metropolitan areas, there is insufficient spectrum for mission critical voice channels. In New York and other areas, there is still a need for spectrum for that purpose. The other 12 MHz was recommended for wideband data channels. Broadband was not even being thought about in the wireless area at that time. We were thinking about broadband with the Internet with DSL at home and other connections. No one was thinking broadband would be prevalent in wireless. On Feb. 8, 2006, the president signed a law requiring TV stations to vacate their analog channels. For many years, the 24 MHz was given to us, but we didnt actually have it. TV broadcasters had the spectrum and had no intention of moving. A lot of us spent time working with Congress to get a law passed to require a deadline to vacate. This was a major effort on public safetys part and a milestone in where were going and how well get there. Voice is split between two segments with the wideband channels in the middle. If you think about it in those terms, this is what we recommended. We wanted a split in the voice channels because we knew there would be problems with Canadian border issues and along the Mexican border. We didnt know when Canada would harmonize along the border. The idea was to have half of the narrowband channels in Channel 63 and in Channel 64. There was a well-thought-out process when we did that. But things have changed. On Dec. 20, 2006, the FCC released the Ninth Notice of Proposed Rulemaking with comments due February 26 and replies on March 12. Thats not long ago. Think how fast things have moved. In that proceeding, there were a couple of noted things — the changing thought process. We believe that the time may have come for a significant departure from the typical public safety allocation model that the Commission has used in the past. That didnt go past us. We saw the writing on the wall. Its not totally without foundation. It was clear to us, NPSTC and APCO and other major organizations that took time responding to the Ninth NPRM. We said we disagree with the idea of taking away the licensing from local authorities. Local government has always had the ability to license. We disagree with the idea that there shouldnt be local options that were well thought out in the proceeding. When all the comments were in and you read the record and saw what was going on and for those of us who talked with FCC staff and commissioners, it was clear the writing was on the wall. This was the way they would proceed. We would see a different model than we ever saw before. For those of us who decided we should get with it and work with it, it wasnt an easy decision. Many believed it was not the best thing to do. When you see where its going and you realize you have to be somewhat flexible and not fight something you probably will lose, you have to work it. Thats what happened. We began to look at different options we would use. What happened was in April, the FCC issued a Report and Order and Further Notice of Proposed Rulemaking that included an extensive set of rules and proposed, suggested rules. Its complex. It has to deal with the lower and upper 700 MHz band to be auctioned. Much was in there that had nothing to do with public safety and much to do with the spectrum to be auctioned. In the meantime, a company newly formed, Frontline Wireless, came on the scene and recommended to the FCC breaking down the spectrum differently and restricting some of it to be built out as a public safety broadband network. This idea started to evolve in the report and order. NPSTC, APCO and others filed extensive comments explaining what their positions were. We realized that if there were going to be a national public safety licensee, we would have to find a way to make it work. We embraced the idea, although with some negative comments from members. The new band plan takes some of the blocks of spectrum and juggles them around a bit. It moves all narrowband voice to the upper end of our 24 MHz of spectrum. It is a good thing for us in efficiency. We advocated that for this to work, we had a plan so that these were not all in one TV channel. To make this work in the Canadian border area, we had to shift it down 1 MHz. We have some of that narrowband voice that can be used along the border until it can be harmonized. Thats a good reason for it. What we have now is a plan that the FCC has recently embraced in one form or another. When we see the order, well know. There will be a single slice for the 10 MHz, or 5 and 5, or spectrum assigned for data for public safety. We expect they will say it is dedicated for broadband. We hope and believe there will be a provision for continuing of wideband systems in some areas and some local authority to do some things in broadband in local areas. We dont know how that will read. The idea is that this spectrum would be controlled under one license is foreign to anything weve known. The D Block, theyve realigned this, according to lobbying by various companies. The D Block will be restricted in the auction to have to negotiate a network-sharing agreement between the national public safety licensee and the D Block owner to build a nationwide public safety network. In a nutshell, this is where this has gone in a period of a few months. The whole idea was for us to be ahead of the curve and to build an organization that would be structured and positioned to apply to be the single public safety licensee. At the same time we issued a request for proposal. All these things are being done by your associations on behalf of the public safety community to be ready for this thing that will move so fast. We set up the process to advertise to be an agent or adviser. Were not business people. Many of you are. We are public safety professionals. We need people experienced in business who understand commercial carriers and how to build out a network that we dont understand. We need to select an agent or adviser to give us that service. On July 9, we released the description of what we wanted. We asked for indications of intent to respond to be sent to us by July 20, and we received 11 responses by that date. The submissions of proposals were due by July 30, and we received 10 submissions. They were darn good responses. They are excellent proposals. We had a conference call last Friday, August 3, to form a review committee. This afternoon or last week the committee has been reviewing and rating the proposals. This afternoon, August 8, we will have a conference call to narrow them to three or four. Those three or four will be notified this afternoon after the selection that theyre invited to oral interviews next Monday, August 13. Im going over this because its fast moving. I dont know ever in my 30 years working with the FCC that anything has moved as fast as this, and we had to keep it moving. I think weve positioned public safety in a position of leadership. We hope the Public Safety Spectrum Trust will be selected to be the national licensee. If so, we look forward to an exciting next six to eight months. Harlin covered a lot of territory … well … a wide spectrum, if you don’t mind … in a short time. Thank-you to Harlin for such a timely presentation. If you can’t see it clearly enough to tell, Harlin’s shirt is RCA fashion wear, sporting the Club name and emblem and a personalized “Chief HRM.” I do not have permission to tell you where you might obtain similar fashion wear. You could figure it out for yourself, I’m sure, or if you get in touch with me, I’ll whisper it to you. This entry was posted on Monday, August 13th, 2007 at 12:28 pm and is filed under RCA news. You can follow any responses to this entry through the RSS 2.0 feed. You can leave a response, or trackback from your own site.